Today I’m honored to introduce our guest writer, Jennifer LaFrance, my beautiful bride. 1 John 3:11 For this is the message that you have heard for the beginning, that we should love one another. These four and five year olds have learned the importance of JOY (Jesus, Others, Yourself). This is what is important in life. Wouldn’t it be great if we all could think like this? In this world that we live in it is so easy to become self-absorbed. Yet, it isn’t about us….we are just living out the life that Jesus has for us. 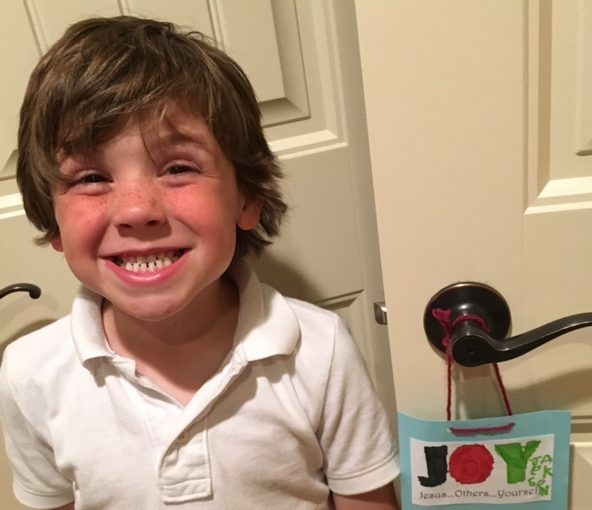 I am reminded of this acronym daily as it is on a door hanger on three of our doors…my son made them in Little Kidsview; one for his brothers room, one for our room, and one for his room. Psalm 78:5-7 He established a testimony in Jacob and appointed a law in Israel, which he commanded our fathers to teach to their children, that the next generation might know them, the children yet unborn, and arise and tell them to their children, so that they should set their hope in God and not forget the works of God, but keep his commandments. Ollie is in my small group on Sunday’s…I love everything about him. He has a great sense of humor, a smile that makes me smile, care for others, and an energy for everything we do. My son, Jackson, is also sometimes in my small group. I have shared Ollie’s updates and pictures with Jackson, and every time we stop what we are doing to pray for Ollie. Jackson wants so badly to visit Ollie and bring him toys (because that’s what kids want to do for each other) and wants him to feel better, JOY. Isaiah 41:10 fear not, for I am with you; be not dismayed, for I am your God; I will strengthen you, I will help you, I will uphold you with my righteous right hand. However we can help, we will, because that is what Jesus wants us to do. I want to teach my children, to do for others as Jesus has done for us…..JOY As you go throughout your day today, and the rest of this week, please try to remember JOY.